A Fresh Direct Delivery Meal Plan! This meal plan for my first Fresh Direct delivery has been a while coming to the blog, although when I made it last week it couldn’t have gone better! I was hoping to post it mid-week (last week) with pictures of a couple things that we’d eaten so far, but life (and pregnancy) won. Looking back at my calendar, I’ll be honest–I’m not totally sure what I spent the week doing, but there was a lot of driving around to errands (just not groceries!) and I’m really trying to stay committed to a light workout routine even though I let it go for a while in the second trimester. I’m trying to walk a mile or two every day, plus do either the Spinning Babies daily activities or some yoga. Note: I have no affiliation with Fresh Direct and haven’t received any compensation or freebies in exchange for this post. If you DO want to support more free meal plans on NCK, you can use this link to do all your Amazon shopping (no extra charge to you). Thanks! Today, after I dropped the Clar Bear off at doggie day care, the rain cut my walk short, and now I need a break from lugging the contents of our dining room (still being used, a year later, as the move-in room) to the basement so it’s ready to seat a crowd at my baby shower! I can make about half a trip down those stairs before being in complete oxygen deprivation. Thank you baby for squishing my airways. Now it’s only a matter of minutes before sitting starts to kill my back and I’m back to the stairs, so apologies if the writing is a little disjointed–I’ll take what I can get for time! Just practicing for the demanding infant schedule. Most of the recipes in this meal plan turned out to be pretty quick. I didn’t time myself, but with a few tweaks that I’ll reveal in subsequent recipe posts, they’re all done in 45 minutes or less, especially if you multitask. Whenever I’m making a recipe, if I find myself standing idly over a simmering sauce or pan of onions, I always ask what else I could be doing: taking an ingredient out of the fridge, getting my colander ready to drain pasta, setting the table, or even doing some breakfast prep for the next day. It’s a habit that’s helped me get dinner on the table much faster than I used to. 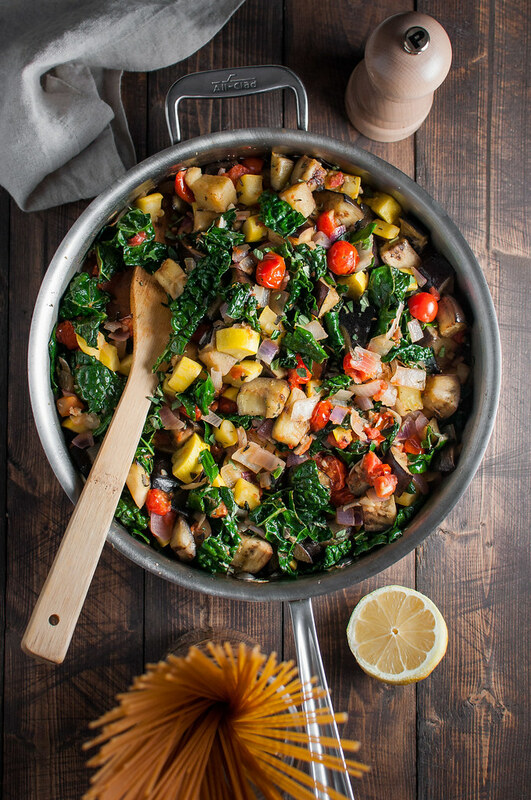 I’d suggest doubling the chili and/or kale ratatouille recipes if you’re trying to stock the freezer. From now until the baby arrives, my strategy is to double at least one dinner a week so we’re not relying on takeout or eating only cheese and crackers for that first week or two. Those two recipes, plus the pot pie ragu, do really well made ahead, refrigerated or frozen. 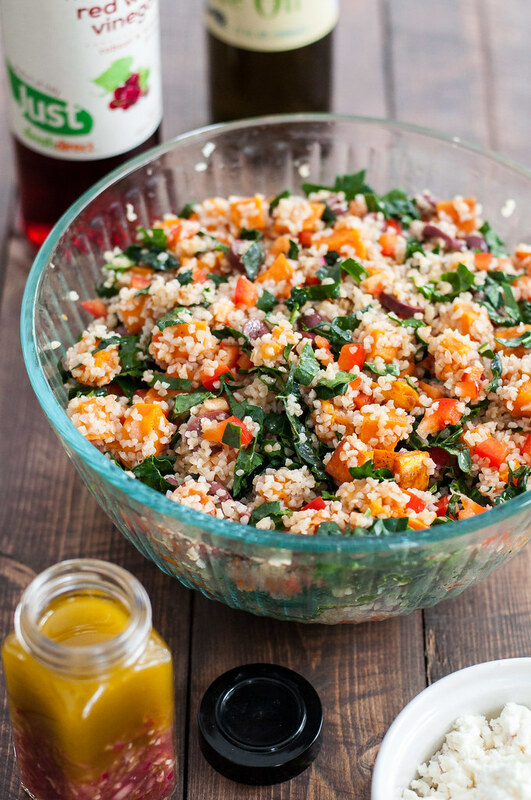 The sweet potato bulgur salad also keeps in the fridge for a few days, so you can easily prep the whole thing at the beginning of the week, then serve cold or at room temperature. I have a lot to say about all of these recipes, but I’ll reserve that for when I post the recipes individually. My only word of advice would be to hold off on the pot pie ragu. I was not a big fan of the recipe methodology as written. I doubled the recipe, which only made about six servings–per the recipe, it should have made eight. Even using the correct pan (a skillet, not a saucepan) my sauce took at least twice as long as stated in the recipe to thicken and properly reduce, even with the increase quantity of flour I used. After all that simmering, my carefully prepared vegetables were rendered kind of mushy and flavorless, having given up all their flavor to the sauce. The good news is that it was still pretty tasty comfort food, but I want to present you with an adapted recipe. I didn’t do a ton of advance prep this week. Breakfasts were super easy; essentially cereal and milk. I did prep the hard boiled eggs at the beginning of the week, though. 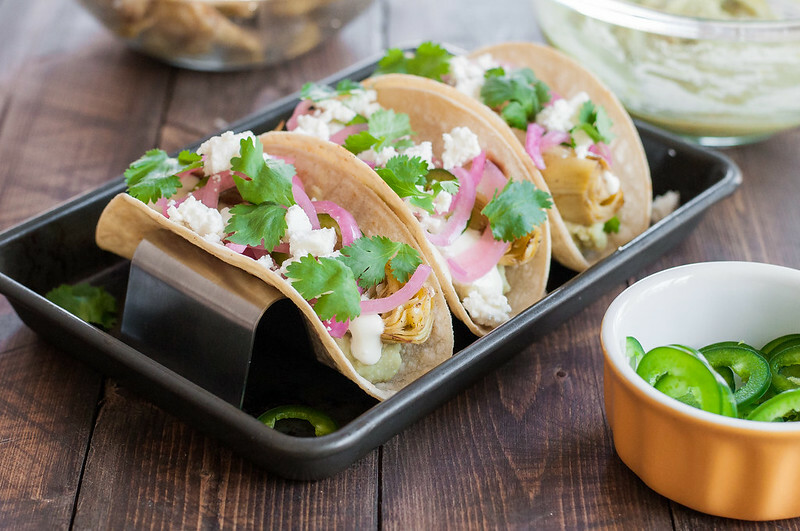 The tacos are the only recipe that isn’t easily prepared in advance, although I did make pickled red onions (from this recipe) at the beginning of the week for both the tacos and chili. Here’s the Google Sheets meal plan and grocery list for your viewing! I’ve updated the recipes with any notes and small tweaks I discovered along the way, and someday they’ll all be posted in their polished format right here on the blog. Lovely recipe. Thanks for sharing Keep it up. ...my food philosophy in a nutshell. I'm Tessa, the comfort food lover, Minnesotan at heart, and home chef behind Natural Comfort Kitchen. Find out more about me, NCK, and my love for healthy, delicious food here. Free one week dinner plan eBook when you sign up for weekly emails! My food philosophy in a nutshell. I'm Tessa, blogger and chef behind Natural Comfort Kitchen. Find out more about me, NCK, and my love for healthy, delicious food here. Use this link to do your regular Amazon shopping, and NCK gets a little commission. Every penny goes into bringing you more healthy, fun recipes.